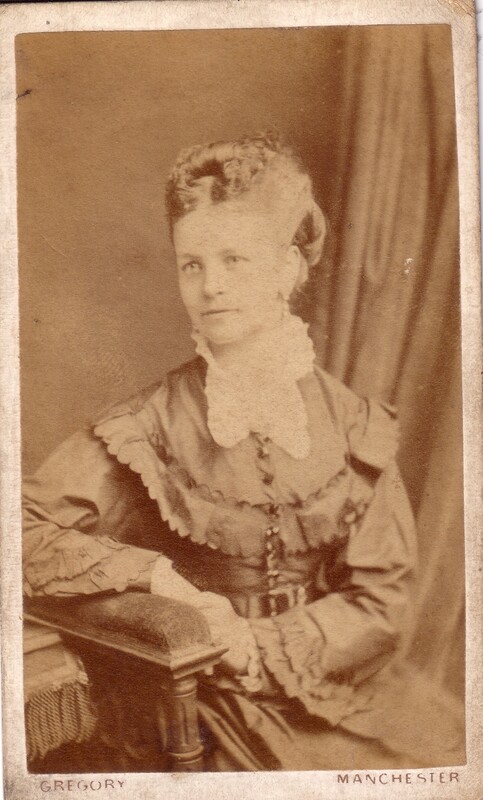 Unknown, poss. 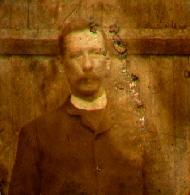 George Henry Stanger. born 18 Oct 1850, Gretton, Northamptonshire. There is an old valentine from him to Annie, apparently as teenagers c.1864. He is listed as "pointsman" (railway points) at mar, living Norfolk St, Manchester (see map). 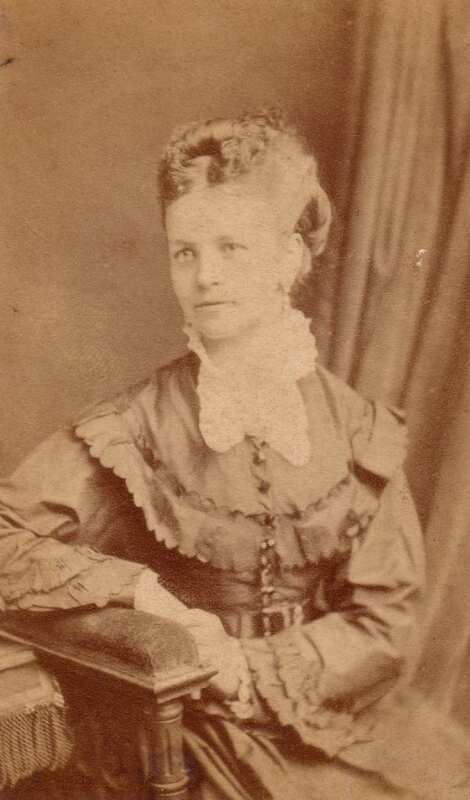 He mar 29 May 1875 (NOT June), St.Thomas' church, Ardwick, Manchester [GRO.UK] to Annie Blundy [born 12 Jan 1850]. He is listed at children's births 1876 and 1878 as "railway pointsman", living 30 Reddish St, Gorton, Manchester (see map). He became gardener at Aldenham public school, E of Watford (see map and street view). The school is really at Letchmore Heath rather than at Aldenham. 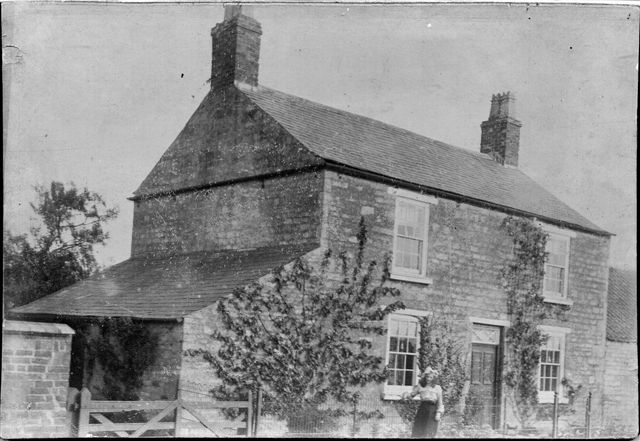 They are listed in [UK census, 4 Apr 1881] as living Corner Cottage, Aldenham. He is listed as "School Servant". He is "Grammar school attendant", living Letchmore Heath, at son's birth Aug 1881. He is "Grammar school servant", living Letchmore Heath, at son's birth 1886. In [UK census, 1891] he is "General School Servant Dom", living Aldenham, possibly in "Back Lane" (Letchmore Heath, beside the school, see map). He is listed as "School Porter" at Aldenham in [UK census, 1901]. He must have died 1901-05. Annie lived, apparently as a widow, at 20 Malden Rd, Watford (see map). Her son John was living there at his mar 1908. 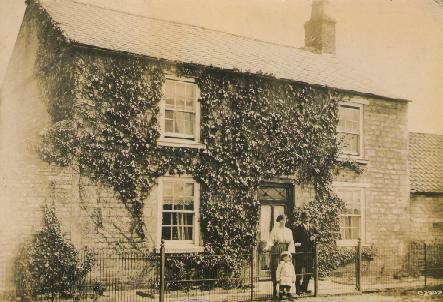 "Mrs. Stanger" (must be widow) is listed at 20 Malden Rd, Watford, in [Kelly's Directory of Watford] 1905 to 1910-11. Not listed there in 1904 or 1912-13. 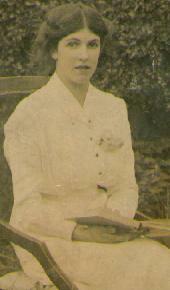 "Mrs. A. Stanger" is listed at 20 Malden Rd, Watford, in [Peacock's Directory of Watford] 1906 to 1912. Not listed there in 1905 or 1913. He is listed as "Steward" (could be deceased) at his son John's mar 1908. He is listed as "School attendant" (could be deceased) at his son Harry's mar 1915. 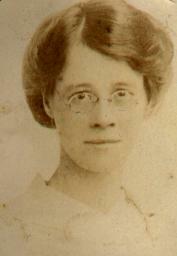 Annie died at Mansfield Woodhouse (son's house) 1923, age 73 yrs. 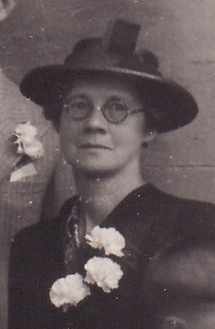 She is NOT Anne M. Stanger, died Wolverhampton, 2nd qr 1924 [GRO.UK]. cremated Fri 17th Jan 1969, Woking, Surrey. 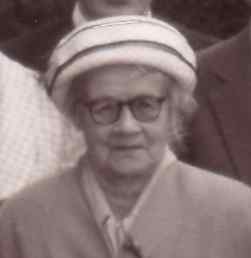 Harry Stanger and Elsie Briggs and Edward. Station master's house, South Witham, Lincolnshire. Photo courtesy of Peter Ball at South Witham site. 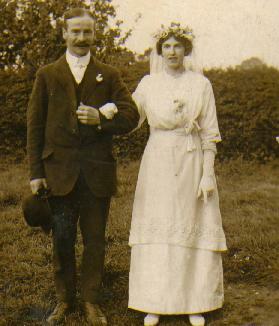 (Left) Harry Stanger and his wife Elsie Briggs (presumably at wedding).